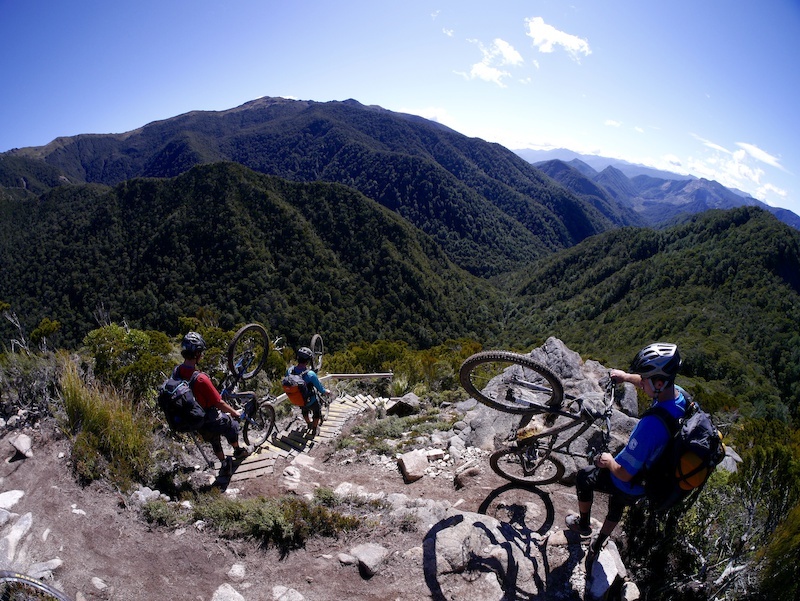 There is no shortage of riding in the South Island of New Zealand, from the trail riding of the North in Nelson to the Park in the South of Skyline Bike Park in Queenstown, you've got a lot to choose from! 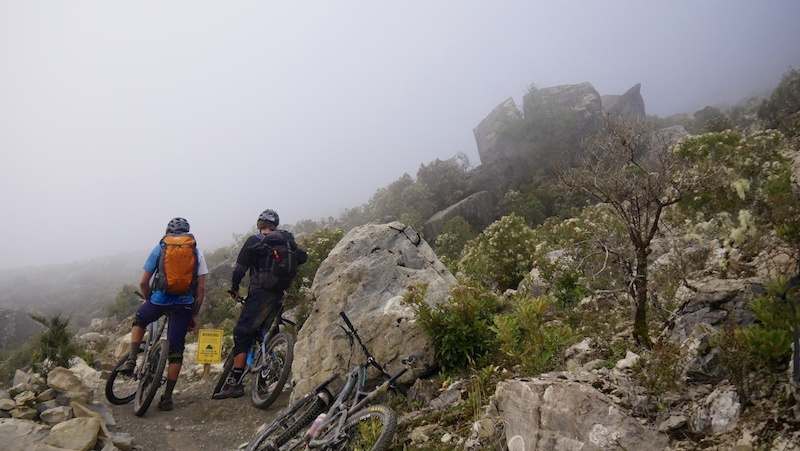 However, there is also 'big mountain' riding to be found and wanting to get a taste of some wilderness, myself, German riders, Max and Fabio, along with NZ native and fellow Peak Leaders graduate, Morgan Walker drafted up a plan to sample the 'Old Ghost Road'. 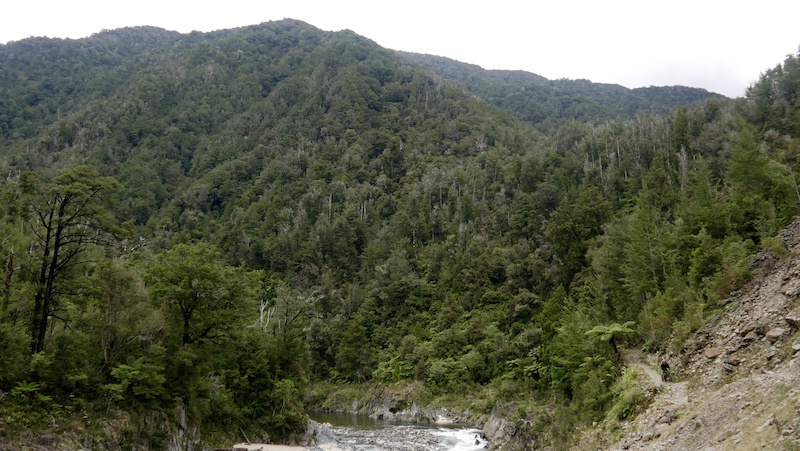 Found in the North Coast corner of New Zealand's South Island, the 'Old Ghost Road' is the remnants of an 85km old gold miner's trail that runs from the 'old dray road' at Lyell in the South to the Mokihinui River in the North. 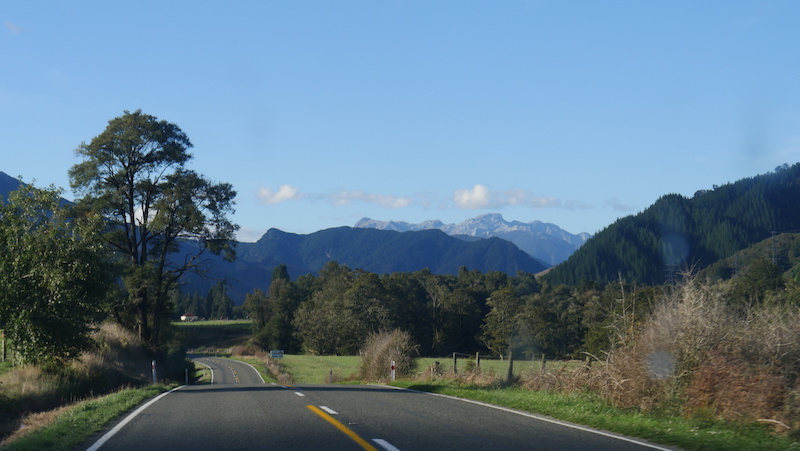 From an idea in 2007, this gradually became a reality in 2013, thanks to the hours of work put in by volunteers with support from the New Zealand Cycle Trail project. 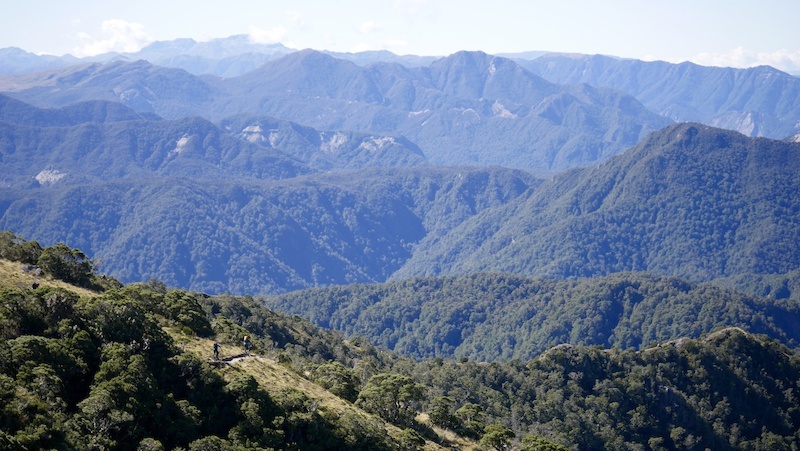 It now runs as a multi-use trail, traversing the same route through the satellite towns that sprung up to support the developing gold industry, across the same diverse terrain that the miners took back in the 1870s. 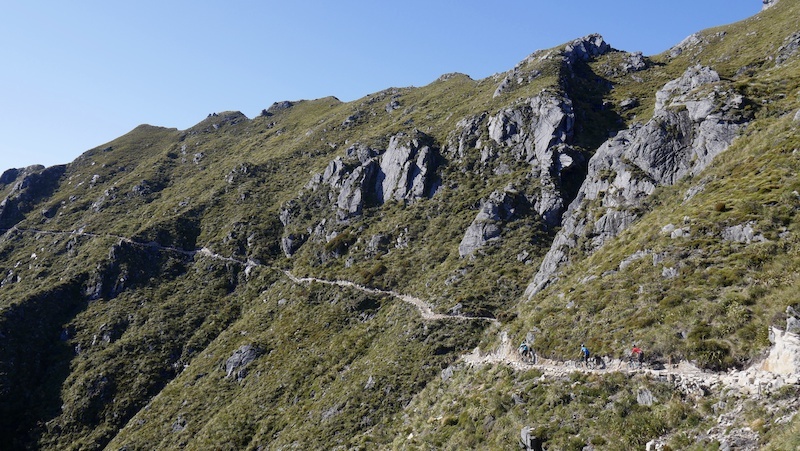 Tackling this trail does take quite a bit of preparation, as making the 85km trip takes you into New Zealand's wilderness means packing for three days worth of food, clothes, and bike related spares that come with unsupported riding. 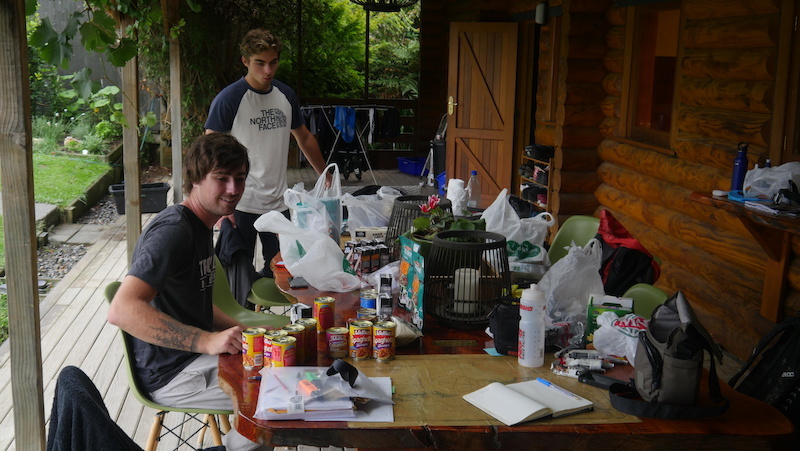 However, thanks to Morgan at Mot Lodge, we were given the perfect setting to assemble our gear and get the lowdown of what to expect on the trail. After counting calories and making the final checks, we packed our bags and loaded up the truck in preparation for a long day, with an early start and drive to Lyell. Home for the holiday at the Mot Lodge. Waking up bright an early (but thanks to DST not quite as early) we made the drive via National route 65 from Motueka to the car park at Lyell, after the obligatory coffee/tea stop in Murchison. 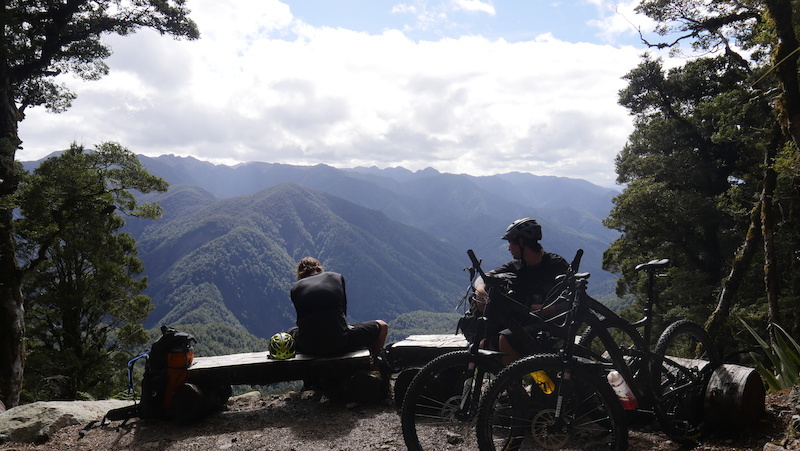 The first day of any trip can be difficult, but this one was made that bit harder adjusting to riding with 20kg packs and making up 1400m of climbing. But getting our packs on and our heads down, we began the grind up. 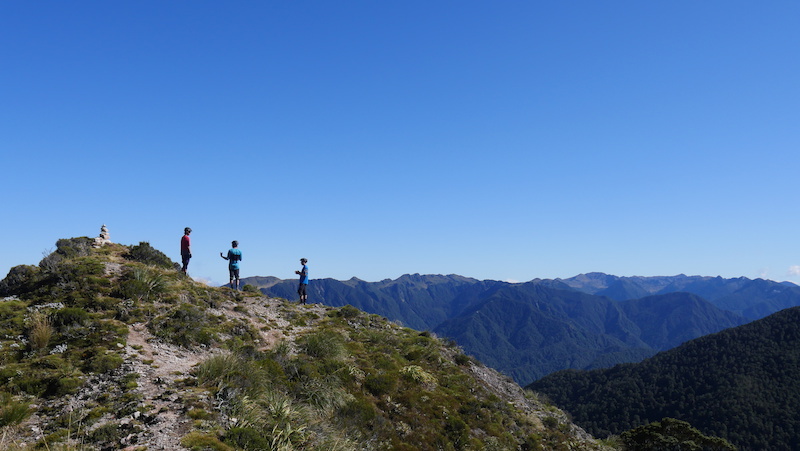 After a short push through the steep and rocky 'Big Slips' (definitely a no stop zone), we arrived at our first stop on Lyell Saddle. There is evidence on the trailside everywhere of the once rich gold trade that established this route. Rusted wheels, buckets, and tools, along with information boards giving you an insight into satellite towns that sprung up to support those that used it, the road has got a rich history to it. It's difficult to think people used to make this trip without all the lightweight and sophisticated equipment we now take for granted! Climbing up on the hillside of Mount Lyell. You are never too far from Wildlife. 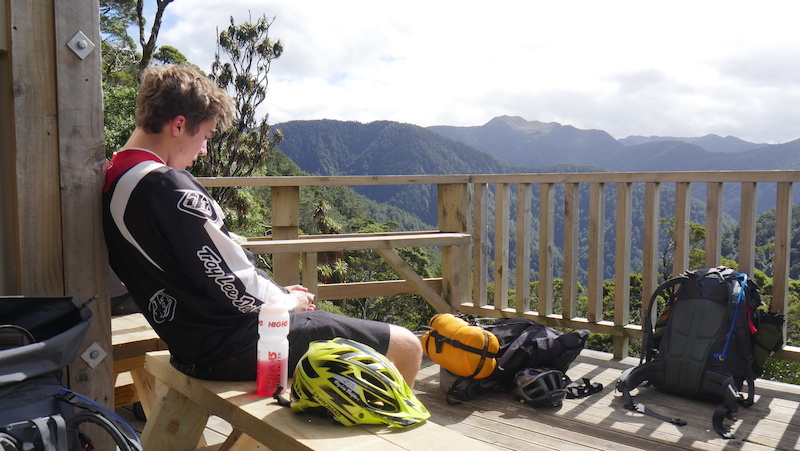 Levelling out and making good progress, we stopped for lunch at Lyell Saddle hut. 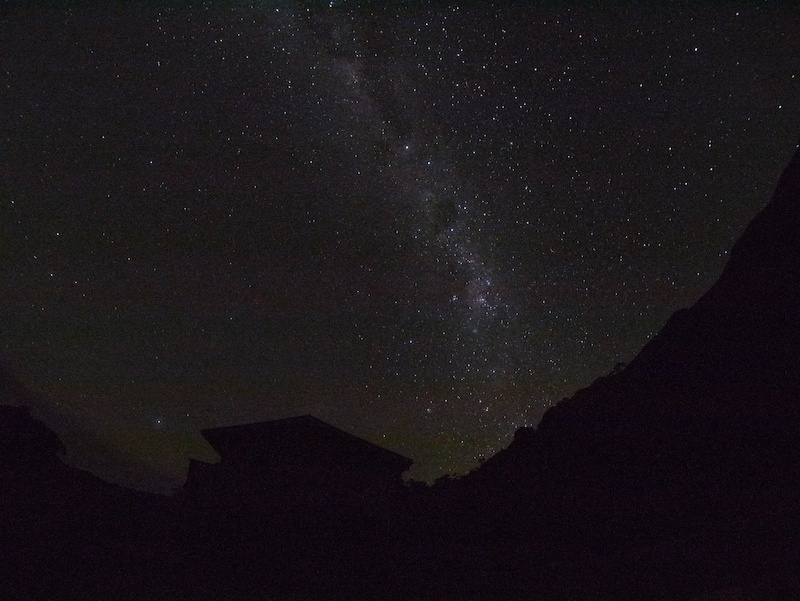 Part of what makes this trip feel less like a wilderness trek and more like a luxurious getaway are the 'hut settlements' found at intervals throughout the journey, all of which pack a woodburning stove, running water and mattresses. 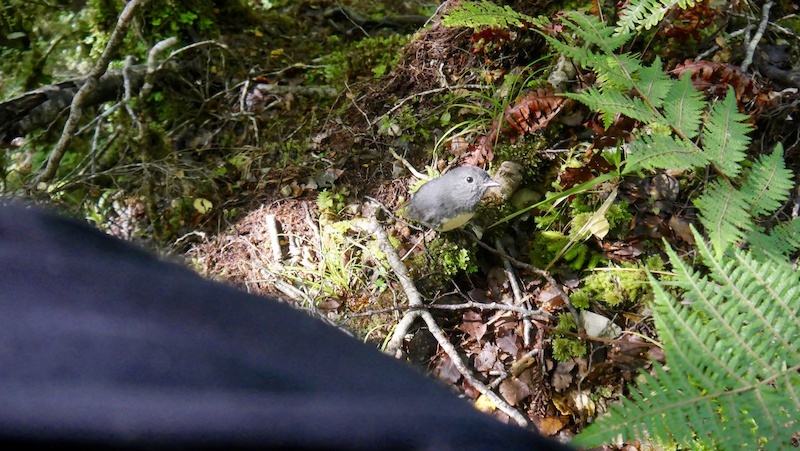 Reaching our first clearing, we got a taste of what to expect, with great views of the forest under the Lyell range. Smashing a sandwich lunch, we went back into the bush for the grind, with another 600m of vertical to get done. Another excuse for a break in the climb. 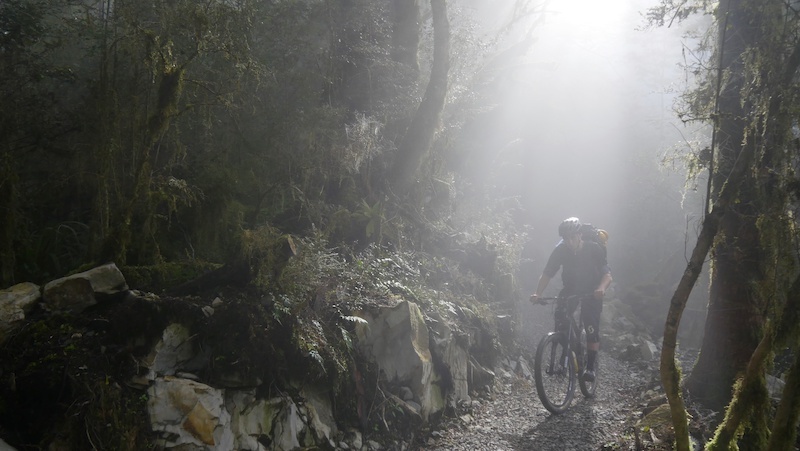 Exposed climbs giving you a taster of what is to come. 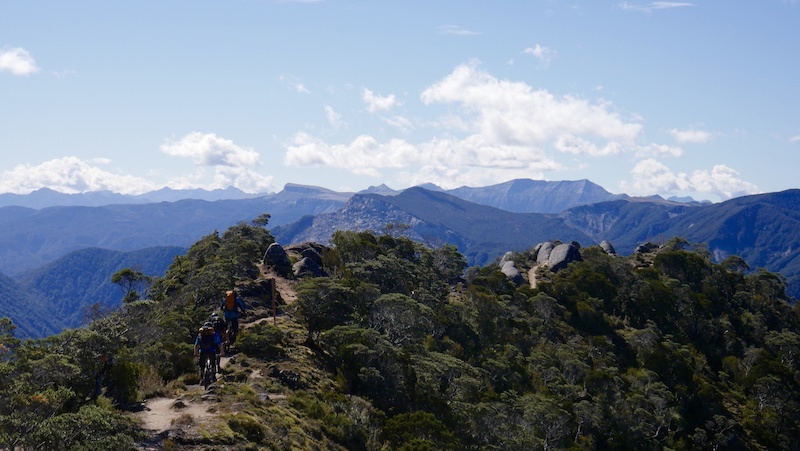 Coming out onto the alpine, we got another reward from all the climbing, an amazing 360-degree vista over Bald Hill and the Lyell Range. Seemingly endless views also came with the first difficult section of trail across to Ghost Lake. Cut into the cliffside, the trail runs between a long drop down to the valley floor one side and a cliff face on the other. 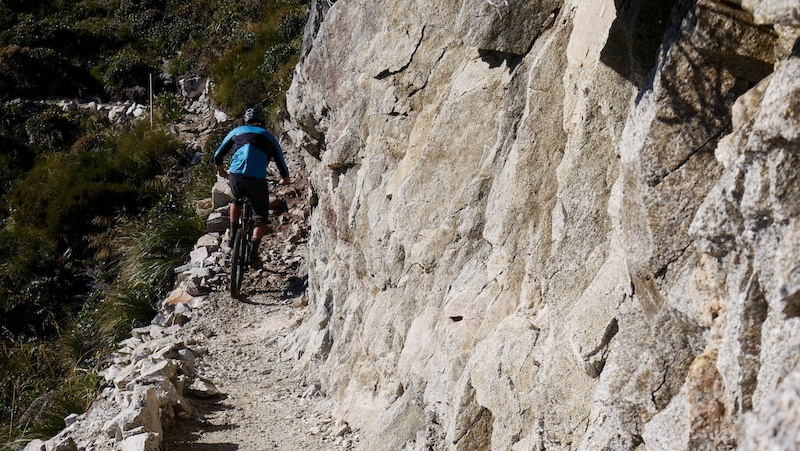 At some points only a metre of so wide this definitely justifies the grade four difficulty given to the trail! But in combination with the views and a late afternoon golden hour it just added to the thrill of the day, and we arrived at our stop for the night buzzing. Heading up past Bald Hill. Ghost Lake is one of the highest set of huts on the trail, but no less luxurious. 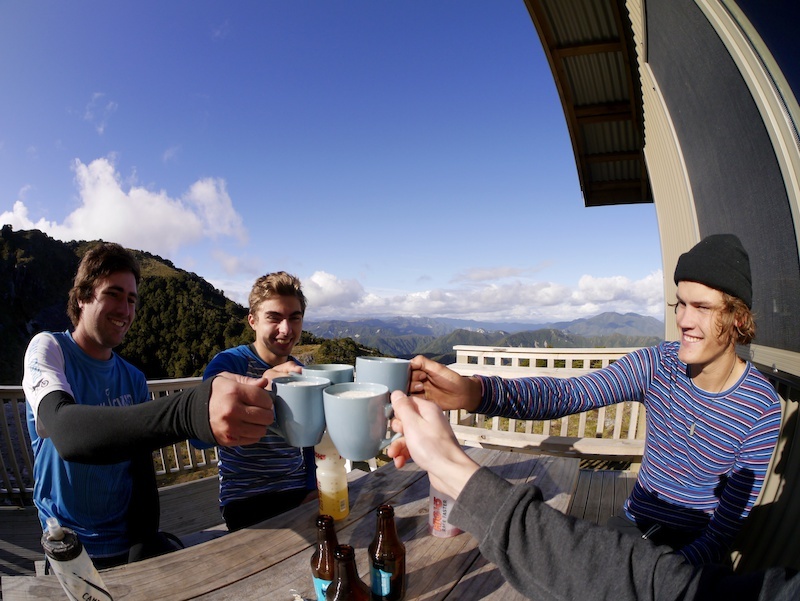 With a bench equipped deck overlooking the valley, there wasn't much else to do than admire the view with a beer whilst the sun set, before heading inside and get a fire going, swapping stories with our fellow campers for the night. It's easy to forget with these home comforts how far removed you are in New Zealand's rugged and wild west coast and really makes you appreciate just how beautiful this part of the world is. 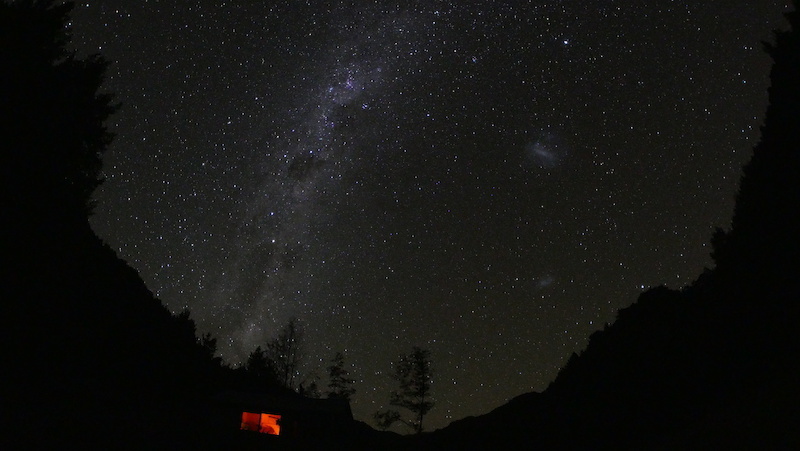 One thing about being in the wilderness this high up is the lack of light pollution, which left breathtaking views of the night sky. 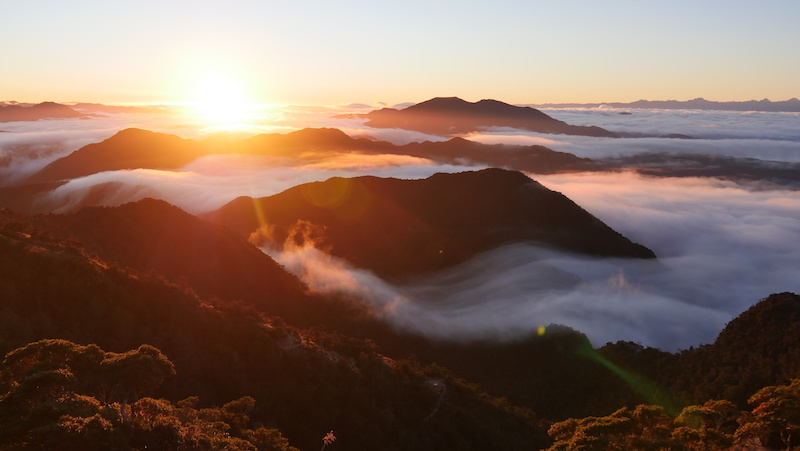 Waking to an amazing cloud inversion, there was no time to lay about in bed. Since we didn't have long to make that day, decided to pedal back and admire the trail from Bald Hill to rocky tor under the bluebird sky and cloud inversion in pretty much every direction! 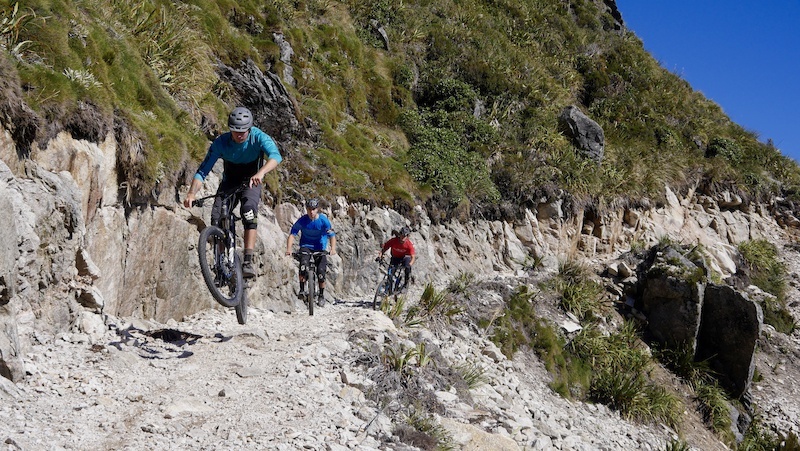 Feeling more confident with the trail having ridden it before, we gave ourselves more of a chance to enjoy it. After making a final stop at Ghost Lake for lunch, we headed for our next stop at Stern Valley. Always an excuse for a break on this trail, even when it isn't uphill. Starting the descent down to Stern Valley. The trail drops sharply down from Ghost Lake, with 800m of descent following steep switchbacks, made even more challenging with packs. 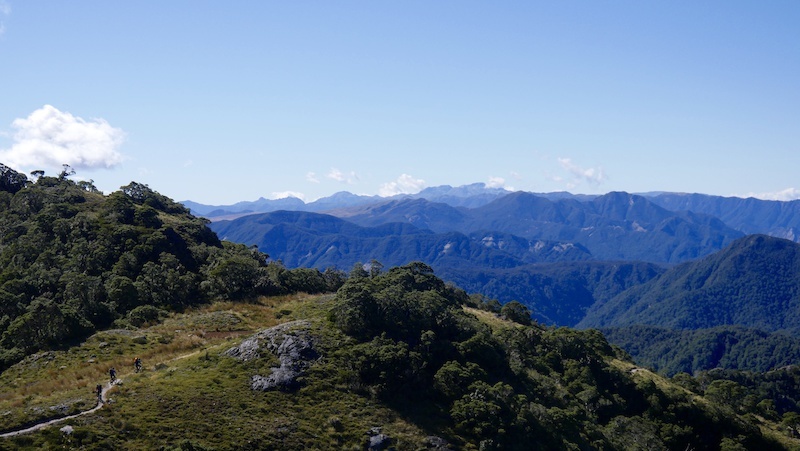 The long technical climb (admittedly with lots of pushing) takes you up on a ridge, whilst getting distracted again thanks to a near 360-degree view and the diverse terrain you pass through. Here we reached the 'Skyline Steps', which pretty much speak for themselves! No chance of riding down these, taking you down another 60m of elevation, we were then rewarded with a long section of flowy singletrack down to the Stern Valley huts. As many textured hillsides as you want. Along the ridge to Skyline Steps. No choice but to hike-a-bike down. 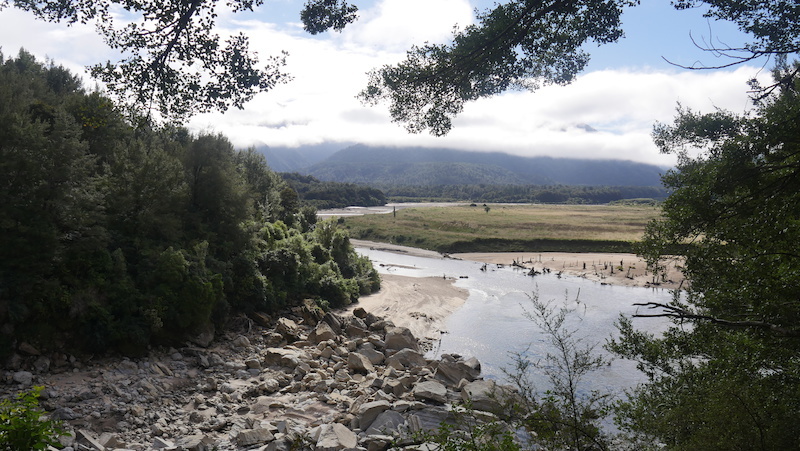 With just enough time for a quick pedal to 'The Boneyard' and cool off in the river before the sun went in, lots of elevation both up and down meant an early night for all of us. Again still blessed with unreal skies to fall asleep under. Having had a middle day, we were left with a bit more distance to cover for the final pedal to Seddonville. Thankfully we got most of this climbing done in the morning, heading up through an eerily misty boulder strewn Boneyard. 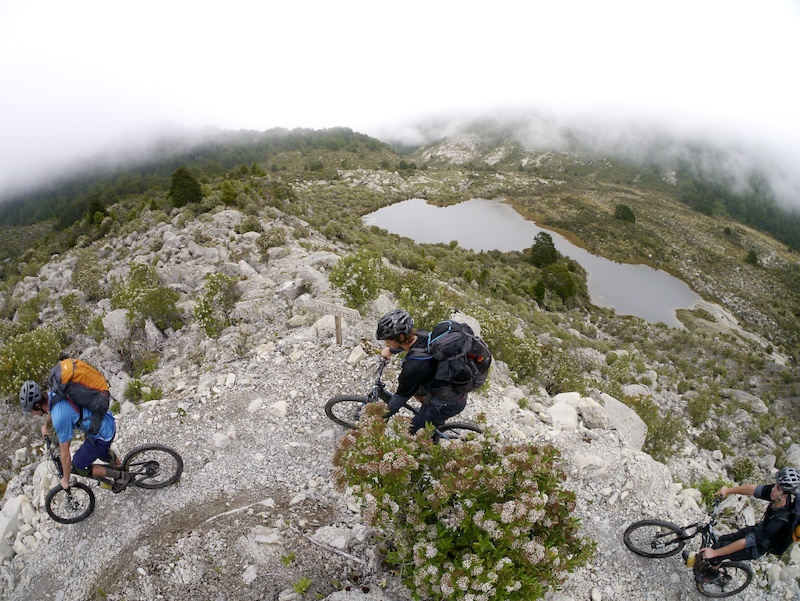 What really strikes you throughout this trail is the diversity of the terrain you pass through. 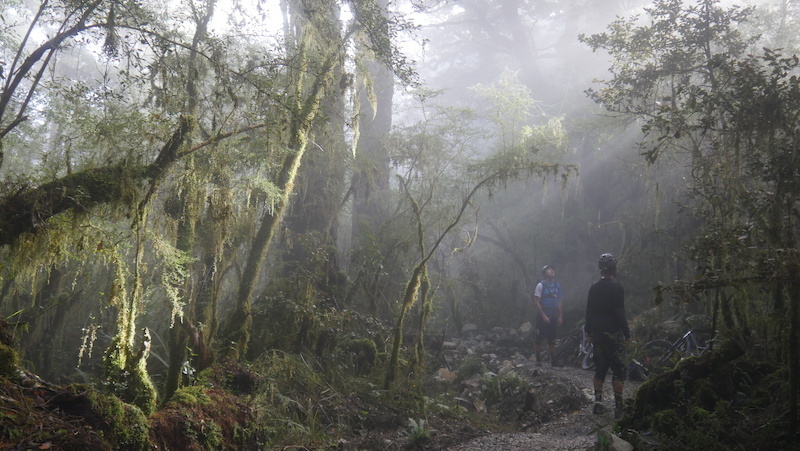 Rich beech forest, high rocky alpine, alpine bush, boulder fields and steep rocky traverses next to the Mokihiuni River, this is a trail that keeps on giving. You never are given anything boring to look at or ride through, which is more than enough to keep you distracted on the long climbs up. Heading through the clouds past Lake Cheerful. Breaking before the no stop zone. Topping out after the Boneyard. 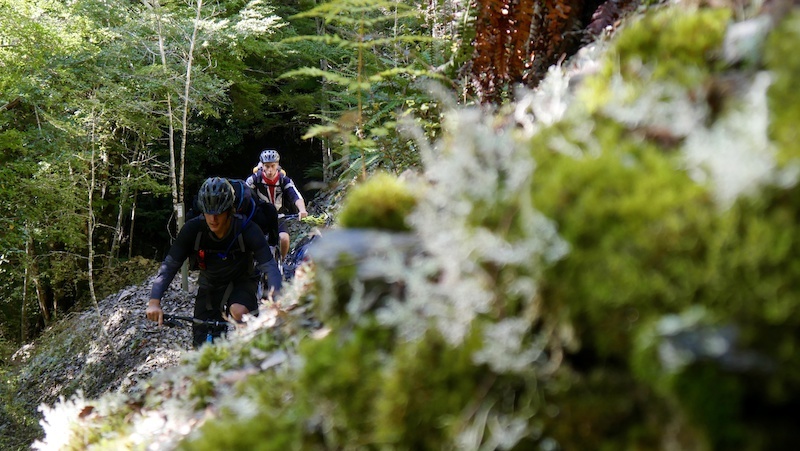 After making it through the no stop zones of the boneyard, we got another prime singletrack descent to Goat Creek, getting to the flatter section alongside the river where the KM's came quickly passing through thick moss covered trees and streams. 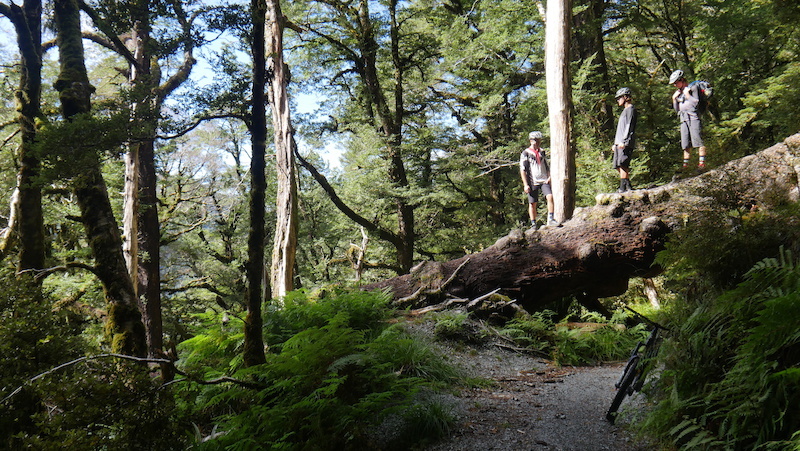 Crossing the suspension bridge and getting past Specimen Point huts, it was onto more steep traverses with a long drop down to the river, definitely another place to not lose a front wheel. Making it out next to the Mokihinui River. Traversing across before the 'Suicide Slips'. Getting into the end we were all fully buzzing and equally hungry. 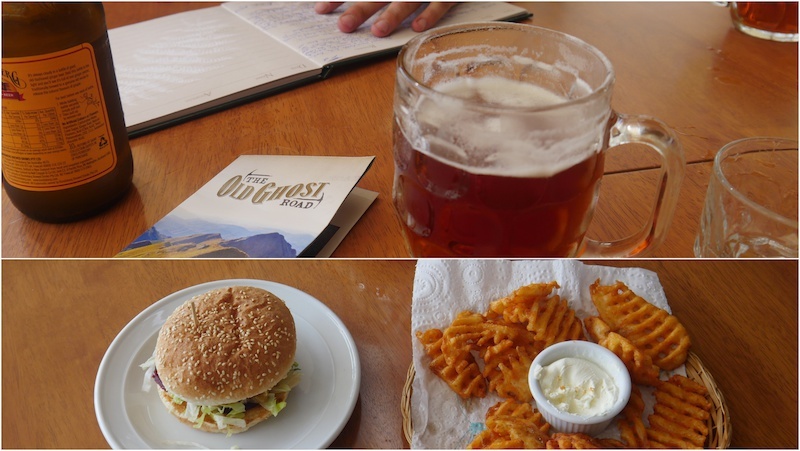 The Seddonville Hotel is an obligatory stop for Old Ghost trippers and we were ready to sit down with a cold beer, burger and have a chat about the best bits of the trip. Reading through the visitors book, there was definitely a recurring theme of 'epic' and I can't help but agree that this trail fully deserves this title. Beer and burger post ride recovery. The drive home wasn't so bad either. For more info on the trail and booking accommodation in the huts, check out the Old Ghost Road website. If you do ride the trail please donate to the Old Ghost road fund to keep the good times rolling! Big thanks to Morgan and Mot Lodge for their hospitality, guidance and use of the killer Yeti SB5c rental bikes throughout the trip! 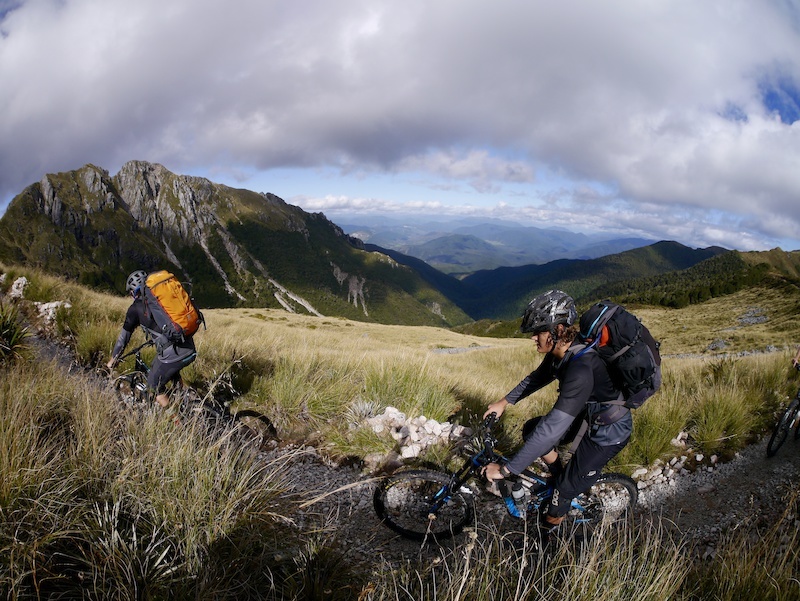 After training and working as a bike park guide in Whistler with Peak Leaders, Morgan Walker now works as part of the Mot Lodge near Nelson, a Bed and Breakfast set in the Motueka Valley within the Tasman region of the South Island. 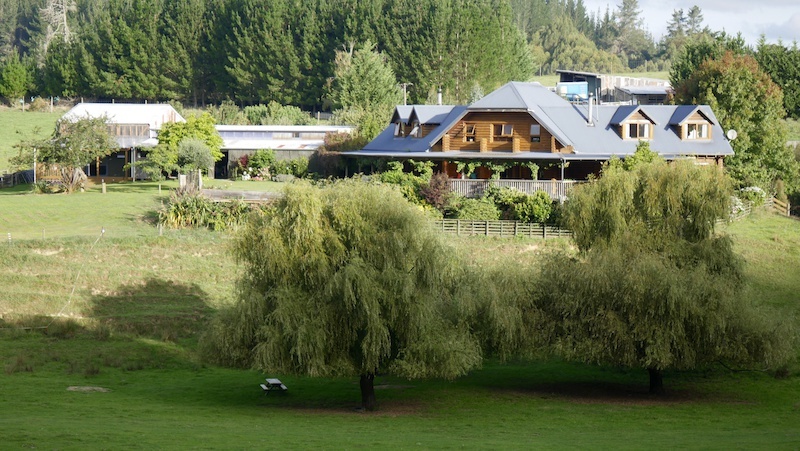 Mot Lodge has established a luxury bed and breakfast with guided mountain bike tours. For more info on staying at the Lodge, check out their website, Facebook page and Instagram. The ride is pretty epic, not too technical but some big exposure. 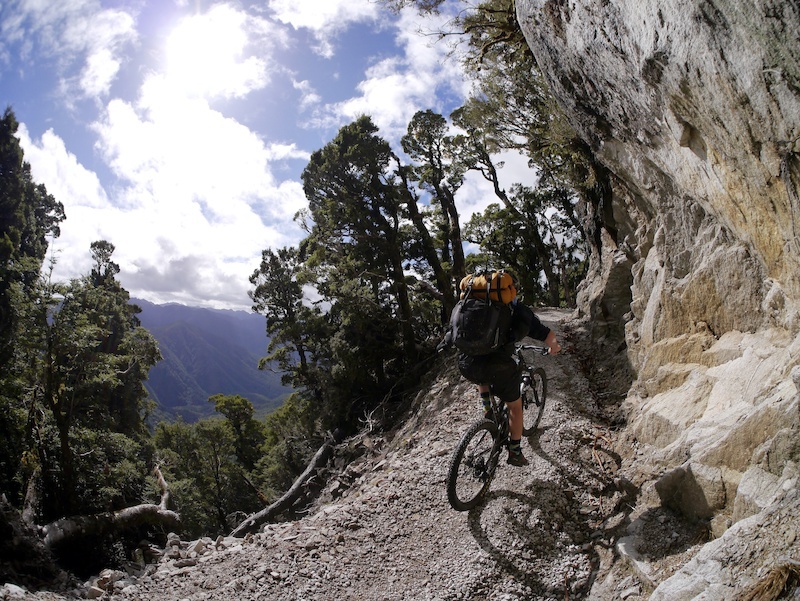 um deciding whether to do this on the fatbike IceCreamTruck or Enduro, decisions decisions, either way it will be epic of epic proportions, to you loopies(kiwi slang for foriengers) piccs do not do this Island justice or that trail! Taking the ICT up this weekend for its maiden trip. Be interesting to see if I find it more fun than the Yeti. Well written narrative. It is however possible to pack way less stuff. 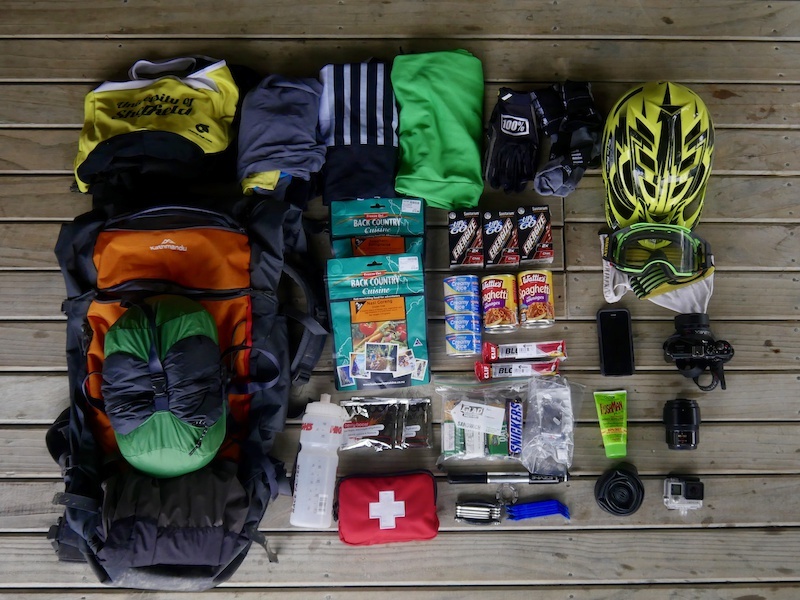 I did it in two days with 8kg pack including cooker sleeping bag, and storm gear. But then I am a geriatric. Folks might normally read this, but it's placed right in the middle of the first WC DH race coverage of the season, so don't feel bad. New Zealand, the most amazing place ever. Hands down. I love a trip. That looks fun.